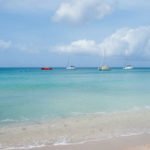 What to eat in St Kitts? 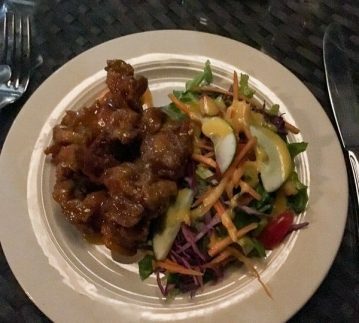 Well, the good news is you’re never far away from a great meal on St Kitts and Nevis. 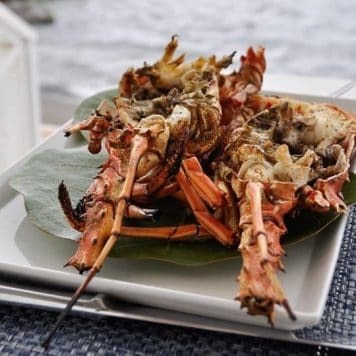 There’s a huge variety of tasty dishes on offer whether you’re looking for sizzling street food and casual beachside eating or high-end hotel and restaurant dining. With an entire coastline to fish from seafood is plentiful with catches of snapper, cod, mahi-mahi, wahoo, conch and lobster. Meat tends to be chicken, beef or goat. The volcano, which peaks in the middle of the island, is named Mount Liamuiga, which means ‘fertile land’. 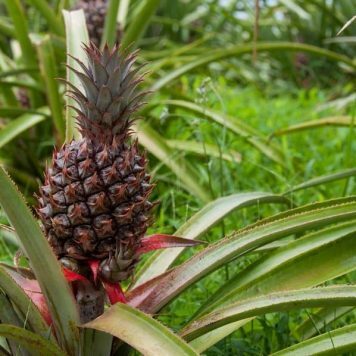 The volcanic soil helps greatly with the island’s crops. Dishes are served up with plenty of vegetables and a dash of Caribbean spice. 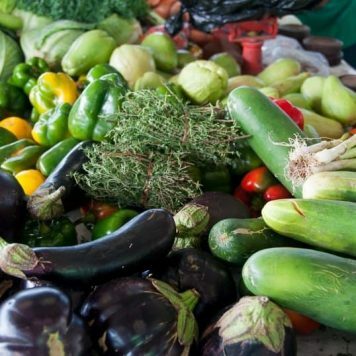 So what to eat in St Kitts? 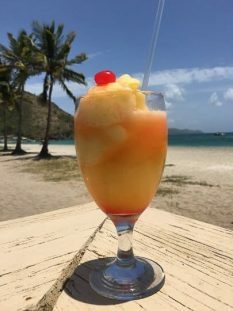 Here’s what tickled my taste buds as I ate my way around the restaurants and beach bars of St Kitts and Nevis. Let’s start with the national dish, which is actually made up of four different dishes; stewed saltfish, spicy plantains, coconut dumplings and seasoned breadfruit which all compliment each other perfectly. 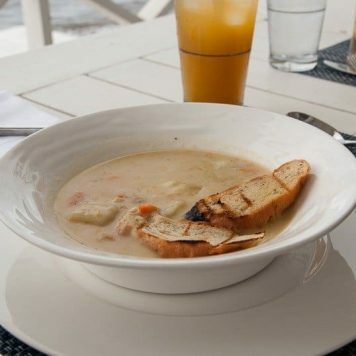 The saltfish is a tasty blend of flaked, salted cod fish, local vegetables, spices and coconut. 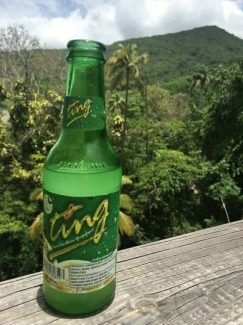 It’s served with spicy plantains, coconut dumplings and seasoned breadfruit, a large round, green fruit with thick bumpy skin. 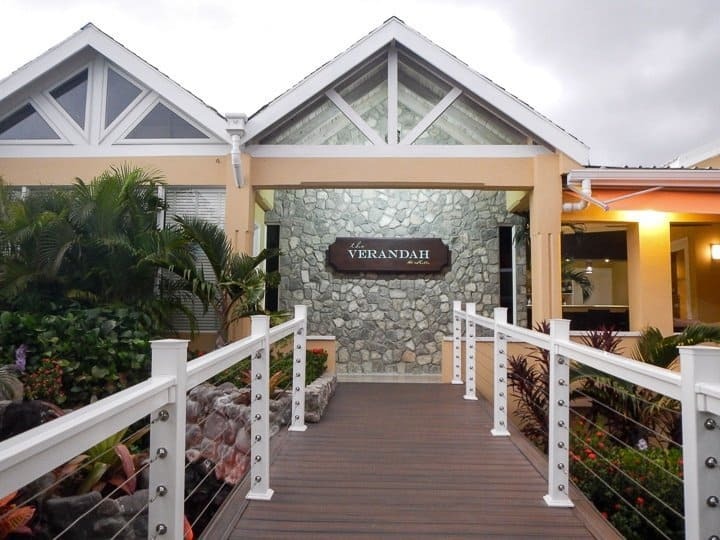 The Verandah Restaurant at Ocean Terrace Inn in Basseterre does great salt fish as part of their Saturday night Caribbean buffet. It’s a great option if you want to try a variety of Caribbean food because there are lots of favourites dishes to try out. 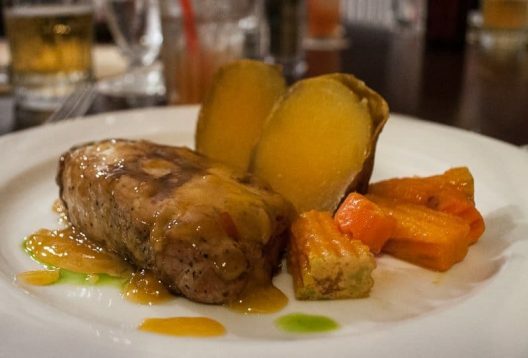 I loved Pork in mango and ginger sauce served with pumpkin and sweet potato which I had from the a la carte menu on a different evening. Fisherman’s Wharf which is also part of Ocean Terrace Inn has been going for over 30 years. 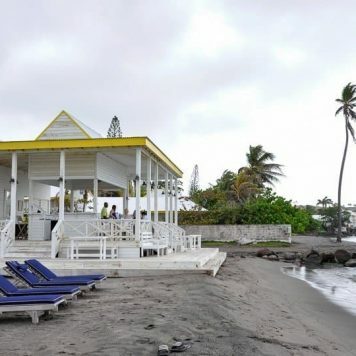 It sits on a small pier right on the ocean with views across the bay to Basseterre. It serves great fish dishes from its open kitchen and has a mean cocktail menu. 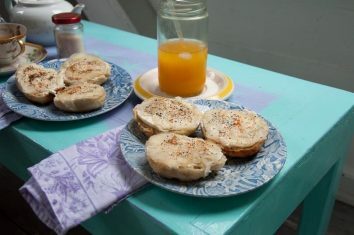 These little bagels were one of my favourite dishes in St Kitts. Warm bagels are spread with cream cheese and topped with slithers of smoked wahoo fish before being sprinkled with black pepper and a dash of paprika. 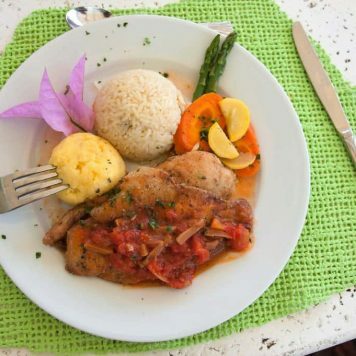 Head for the Gallery Cafe on the Square in Basseterre for a taste – you won’t find better anywhere else. The gallery, run by Rosie Cameron and her daughter Leah, is filled with vibrant art from local artists and is a complete haven of calm. The perfect place for a wahoo bagel breakfast and a coffee or fresh juice. These are little Kittitian gems. The fluffy dumpling dough is flavoured with coconut and went perfectly with my grilled snapper soaking up the Creole sauce beautifully. I had my first Coconut dumpling revelation at Arthur’s, which is part of Belle Mont Farm. It sits right on the black sands of Dieppe Bay overlooking the ocean. You can literally watch your main course being caught as you eat your starter – you surely can’t get fresher fish than that! 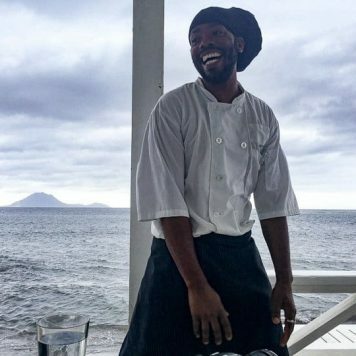 The chef at Arthur’s was one of the happiest people I’ve ever met! Ahh, the joy of Johnny Cakes! 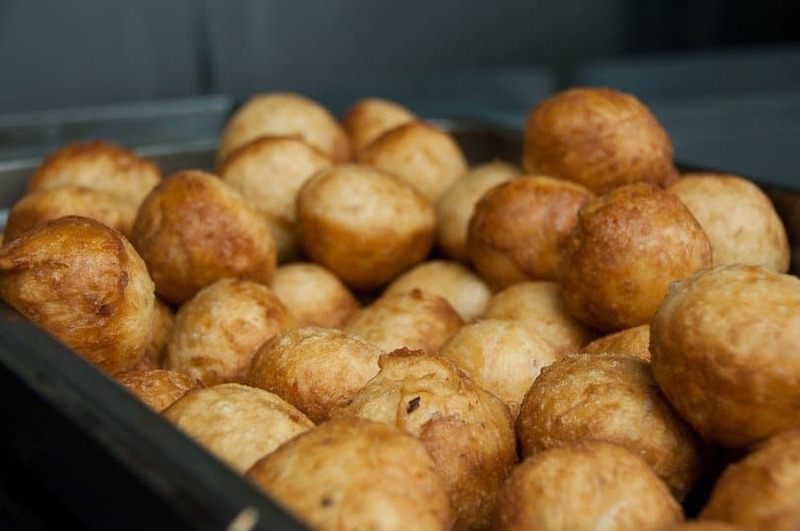 These little golden balls of loveliness can be found in any St Kitts’ restaurant worth its salt. They’re made of deep-fried unleavened bread and are slightly sweet. Sometimes coconut is added too. Great dipped into your goat water or sliced open with some salt fish or smoked wahoo slipped inside. You must not leave St Kitts without trying Johnny cakes! Roti is a flour pancake or wrap, like a tortilla but the Caribbean version is a bit lighter. 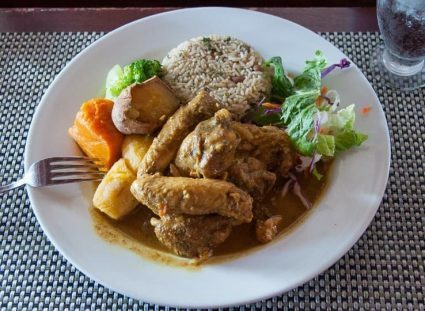 It has various fillings including curried or fiery jerk chicken, mutton, shrimp or chick-peas for a veggie option. 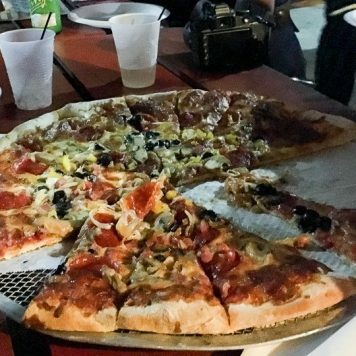 They’re the perfect snack for a day on the beach spent ‘liming’ (chillin’) with friends and Reggae Beach Bar and Grill is the perfect location. After working up an appetite kayaking around the bay a plate of tasty roti and chips (shhh!) really hit the spot! For the rest of the day I just followed their motto “Rush Slowly , Live de Life , It’s all good”. It’s not all meat and fish on St Kitts. Ital is vegan and vegetarian food often favoured by Rastifarians. I feasted on a massive plate of goodness from Ital Creations, a roadside food truck set on Fari organic farm just outside the Port on Fred Williams Highway. 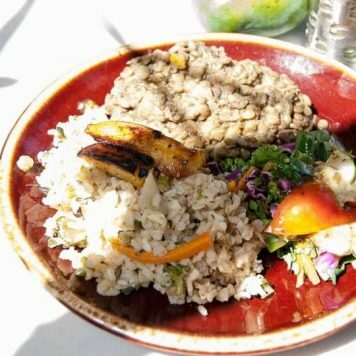 Fari and his wife served up a delicious and colourful meal of organic rice, vegetables, lentils and salad doused with a gorgeous guava dressing all home-grown and harvested from the farm. 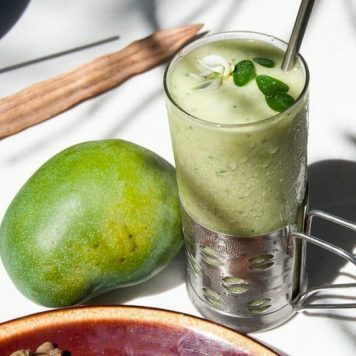 A superfood moringa smoothie washed down all the goodness followed by a bite or two of the most amazing banana cake. 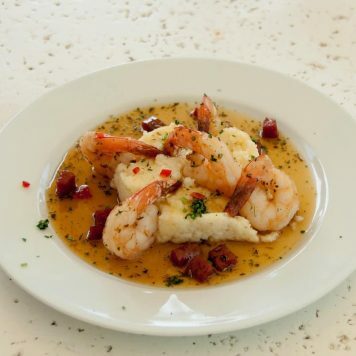 Sprat Net serve up lobster, Cajun Grouper and snapper from their open kitchen – after all the owners are life-long fishermen. But after eating a lot of fish over the week I was in the mood for something less fishy. 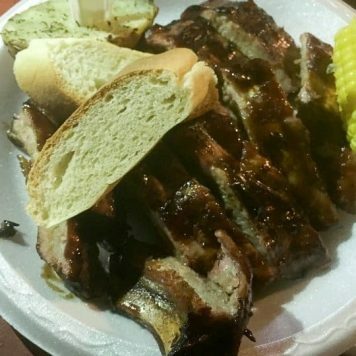 Sprat Net also serves up pizza, BBQ ribs and chicken. 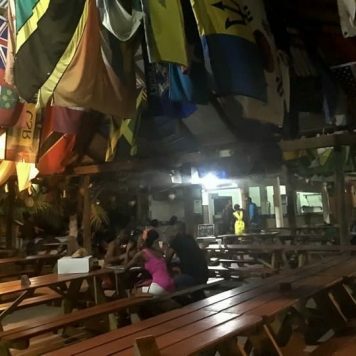 It’s all eaten picnic-style on long wooden benches, throw-away plates and cups and nautical flags decorating the ceiling. The dance floor livens up the evening with live music to really get the party going on certain nights of the week. 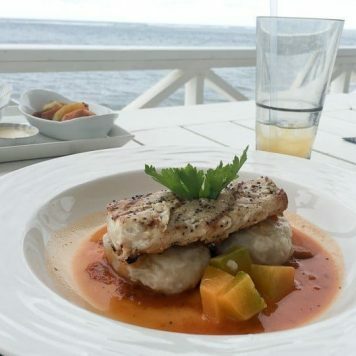 Wahoo is a tasty white fish making it ‘catch of the day’ on many of the island’s menus. I enjoyed it served up with seasonal vegetables and coconut scented jasmine rice at Spice Mill in Cockleshell Bay. 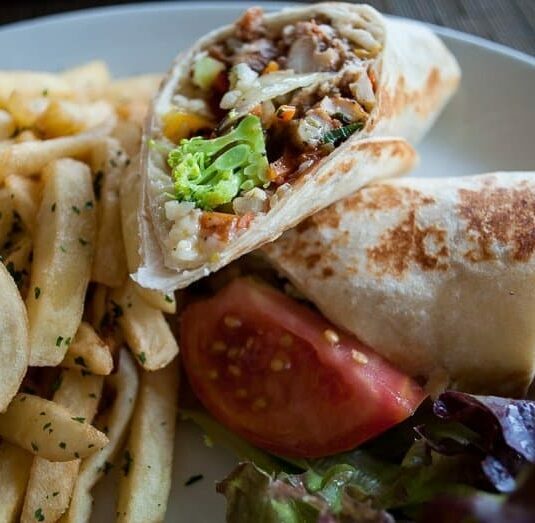 Spice Mill is one of St Kitt’s more upscale restaurants dishing up top-notch Caribbean cuisine. The restaurant and bar is right on the beach so you can listen to the sea as you enjoy your meal. Don’t forget to start your evening with a cocktail – the passion fruit caipiroska packed a zingy punch. Yes, you read that right, but this dish isn’t what you think! Goat water is actually a rich tomato gravy or stew with small pieces of goat meat, breadfruit, paw paw and a fluffy little dumpling. 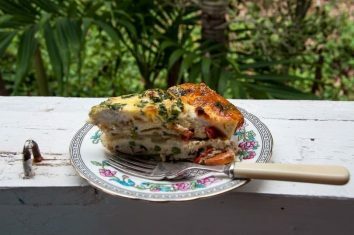 It’s delicious and used to be St Kitts’ national dish. I had goat water as part of the Saturday Night Caribbean buffet at The Verandah. 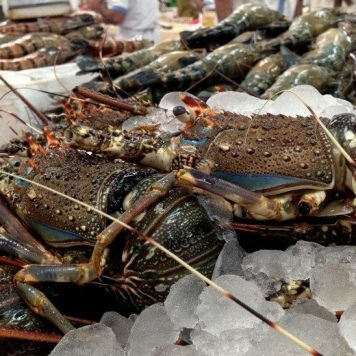 Lobster is plentiful in the waters around St Kitts so it’s offered on many menus. 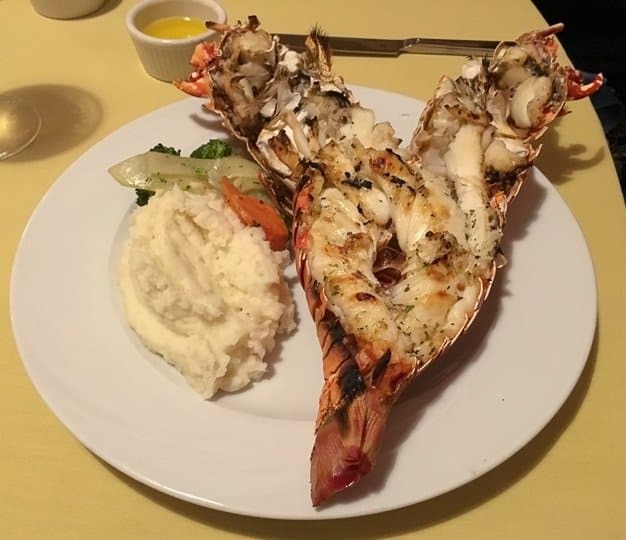 Although I can’t eat lobster (I’m allergic to most shellfish) our group tried it at Arthur’s, Sprat Net and at the Marriott Blue Seafood restaurant. Everyone in the group agreed that the Blue Seafood Restaurant lobster was the best. 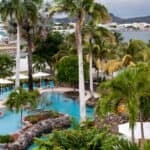 As it’s just one of eight restaurants at the beachside St Kitts Marriott resort you’ll be spoilt for choice trying to decide which to eat at. 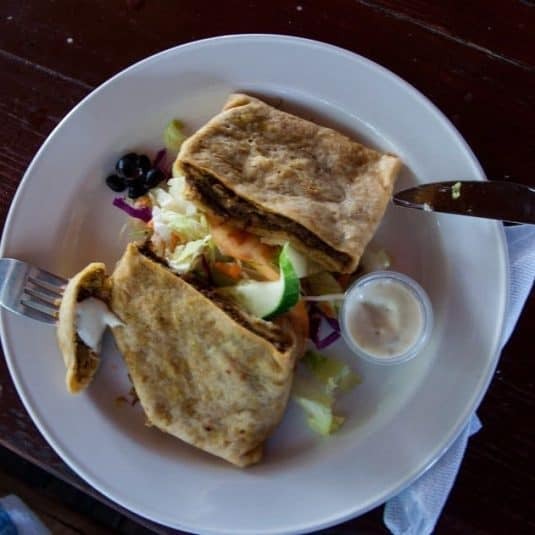 Jerked chicken has got to be a Caribbean favourite and I had mine for lunch in a wrap with salad and chips at Ballahoo Restaurant in Baseterre. 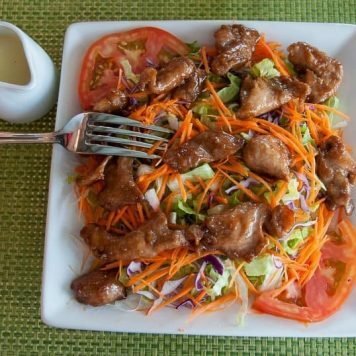 Ballahoo offers a huge menu of Caribbean fare with an Asian influence. You’ll also find curries and sushi on the menu. 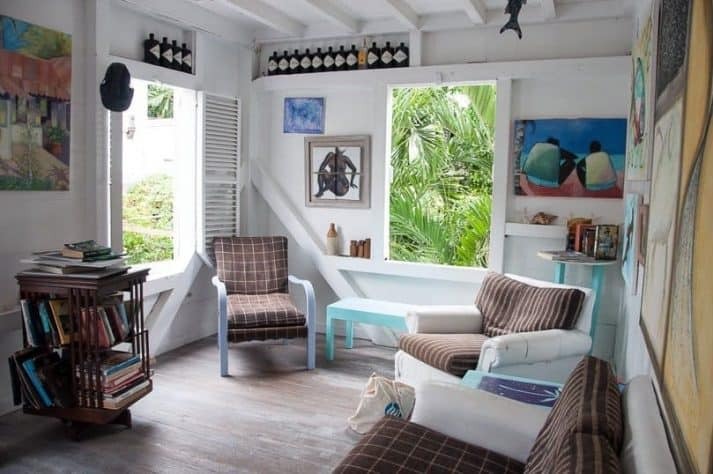 Go upstairs to eat on the colonial style verandah for open-air views over the circus, Basseterre’s busiest part of town. A great spot for people watching on the balcony whilst sipping your frozen mango and passion fruit Ballahoootini. 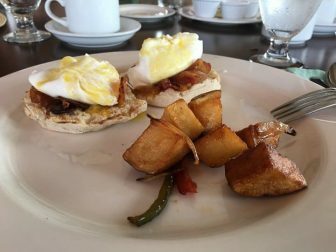 The best brunch on the island has to be at the Royal Palm Restaurant. It’s at Ottley’s and set in the ruins of the plantation’s old sugar factory. I started with a few pickings from the tropical fruit and pastry platter. 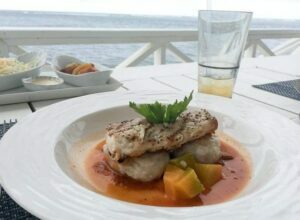 For the main course I chose a traditional dish ‘Tilapia Martinique’ which comprised of fish with tomato-toasted almond sauce, cornmeal fungi balls (the Caribbean version of polenta balls) vegetables and Caribbean rice. 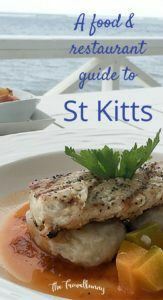 You can read more about Ottley’s and my meal here St Kitts – The Luxury List. 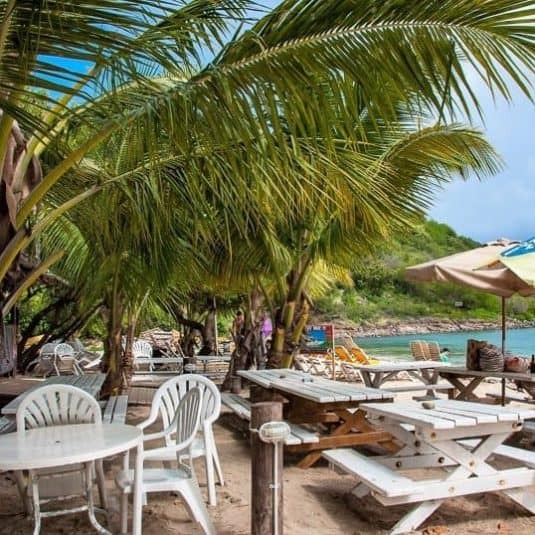 Take a walk along the strip at Frigate Bay and, if you can pass by all the delicious smells wafting from the beach shacks and bars en-route, you’ll arrive at Boozie’s on the Beach. 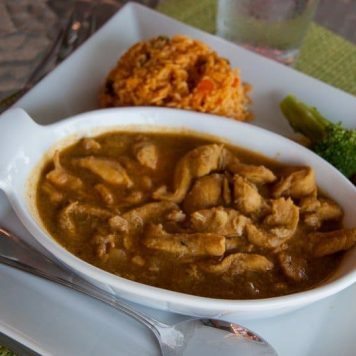 Stop by for some authentic West Indian food right by the sea. The chicken curry was moist and tasty with meat on the bone and not too hot on the spice scale. It came with sweet potato, plantains and Caribbean favourite rice and beans. 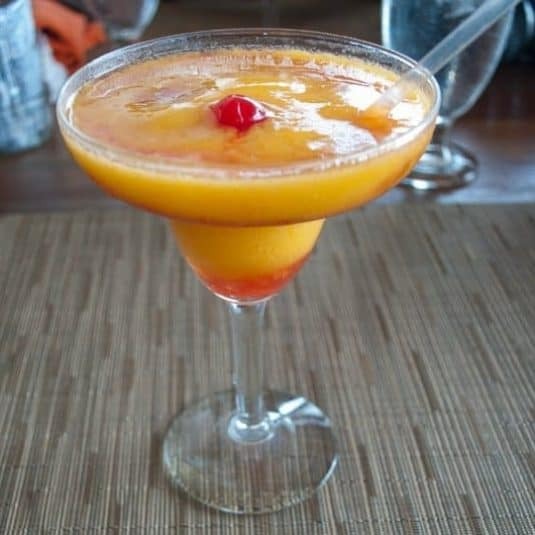 You’ll also want a cocktail to go with your white sand beach and palm tree views and a frozen mango daiquiri will quench your thirst beautifully. Palm Court Gardens and Brasserie also serves up a delicious chicken curry along with other tasty dishes like shrimp tacos and chicken salad. 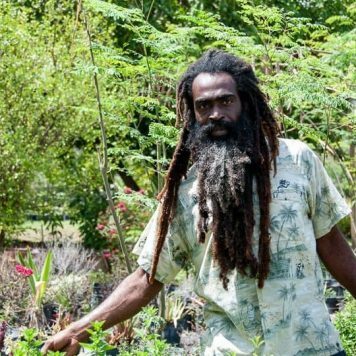 It’s a little oasis of calm and luxury set in beautiful gardens just around the bay from Basseterre. 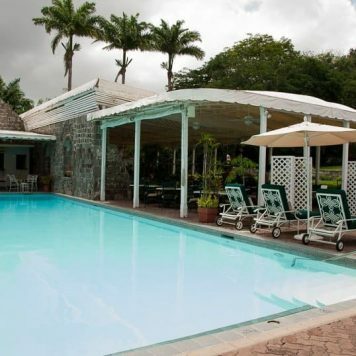 You can walk it in less than 15 minutes and they offer a day pass to enjoy the pool and gardens. Perfect if you arrive on the island by cruise ship. 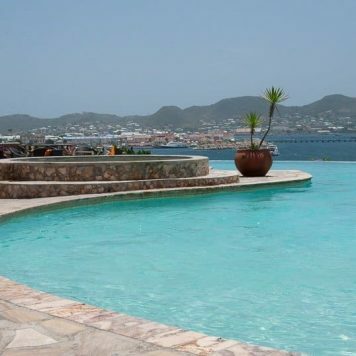 As well as great food there’s a pool, sun loungers and stunning views out to Nevis. 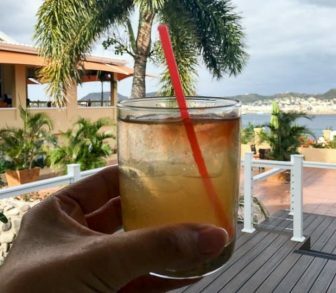 The island’s signature drink, Rum Punch, is served almost everywhere. 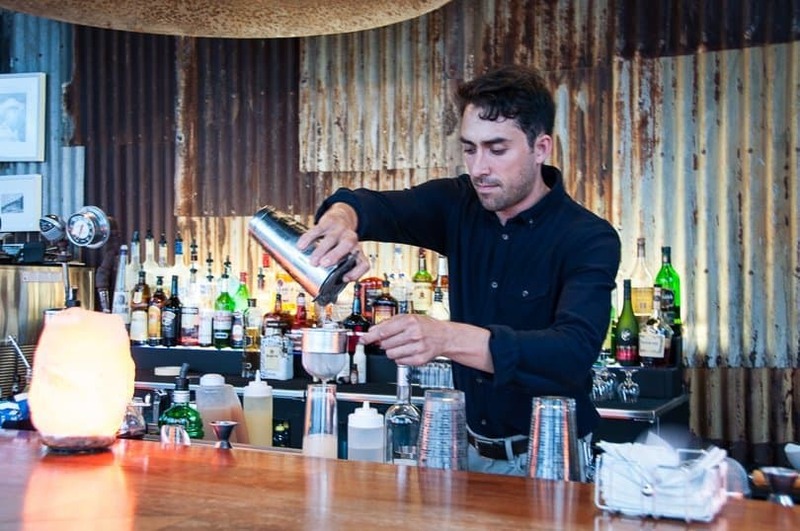 Every bar has their own twist on the recipe and it’s usually a bit of a secret. 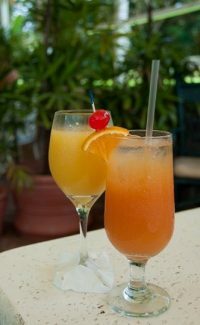 It’s agreed that it must have four particular ingredients to work; rum, lime juice and two types of fruit juice. Angostura bitters are added and a sprinkling of nutmeg to give the punch extra punch! 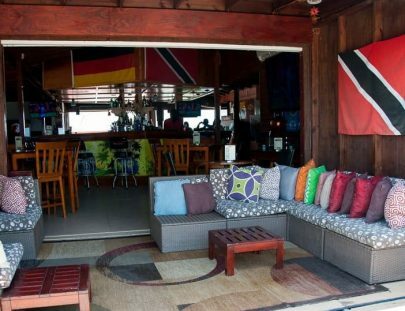 Take things a step further and hop on a boat to Nevis and visit the infamous Sunshine’s Beach Bar. 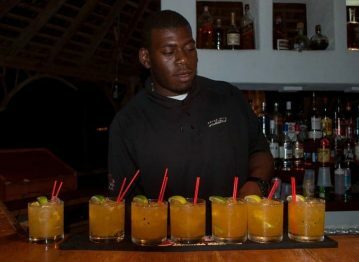 Sunshine’s famous signature drink ‘Killer Bee’ is rum punch with a big sting! 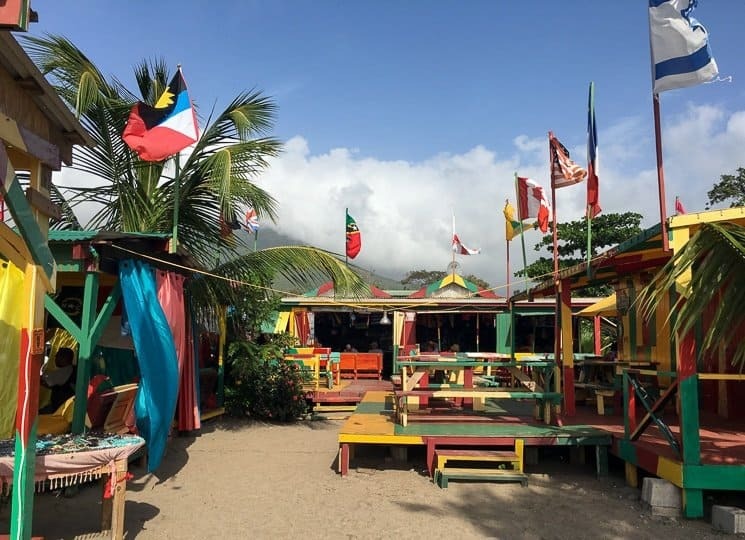 You haven’t visited Nevis if you haven’t had one of Sunshine’s Killer Bees. 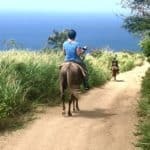 Just don’t have too many or you won’t remember your visit to Nevis at all. 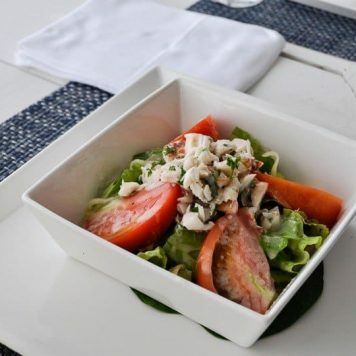 Because there’s so much good food and drink available in St Kitts and Nevis the islands celebrate every year with the St Kitts-Nevis restaurant week. This special foodie week runs from 13th to 24th July 2016 when the island’s restaurants offer special tastings, menus and discounted prices. You can find out more and check which restaurants are taking part here. 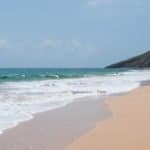 I’m a St Kitts Official Ambassador – my thanks to St Kitts Tourism Authority for arranging my visit to St Kitts and to British Airways for flying me there. As ever, all views and opinions are my own. This is a wonderfully informative article…I especially miss the grouper and lobster…coming back for more soon. I did not find any authentic “jerk” chicken (Ballahoo’s was disappointing). 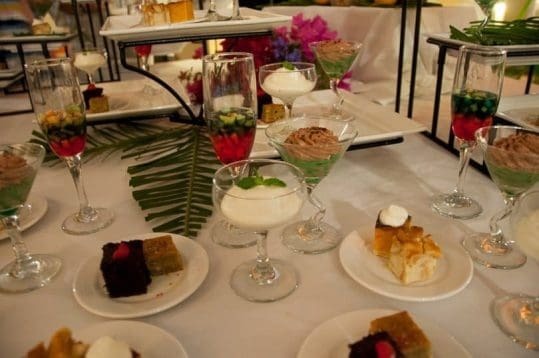 The buffet at OTI looks awesome…will definitely try it on this trip. WoOOOOooW! Paradise in more than one way … food!!! Fantastic post, Suzanne! 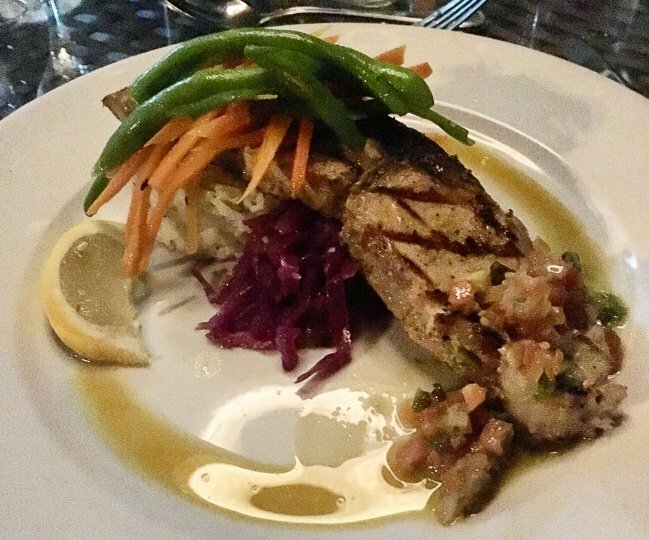 Thank you Viveka 🙂 The food in St Kitts was amazing and so fresh, you could watch the fish being caught from the restaurant on the beach! They were pretty good – the restaurant was right on the beach and we watching the fishermen bringing in their catch. Don’t get much fresher than that! Oh this brings back so many great memories. So many great restaurants serving fabulous food, not to mention the cocktails! I’ve a recipe for the rum punch on my latest post. a lot of ingredients but well worth the effort. Looks fantastic! I was wrong to read this before I ate dinner – you have me craving lobster now! I love how different islands make the flavors and the food their own. 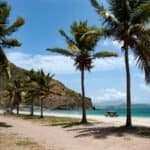 St. Kitts is one of the islands I have yet to make it to, but it’s climbing higher and higher on the list! 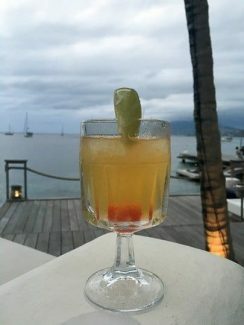 The food in St Kitts was so good – definitely your next Caribbean island visit I think! The smoked wahoo bagels sound fabulous! How many Killer Bees would you drink in one go? Mmmm. This has taken me straight back to the Caribbean – not St Kitts (yet) but all the wonderful flavours and fresh fish. The coconut dumplings sound great. The dumplings were delicious and great for mopping up sauce. I hope you get to St Kitts soon it’s a beautiful little island.